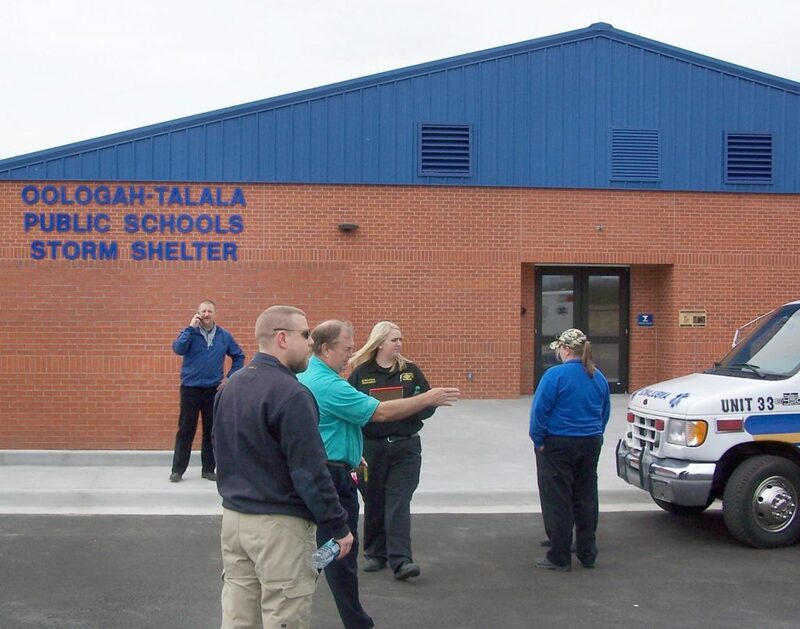 In what is believed to be the area’s largest such system, Oologah-Talala Schools now provide shelters designed to withstand an EF-5 tornado for all 2,000 students and staff during the school day and up to 2,750 district residents when classes are out. “Due to the dedication of its patrons in approving a $4.17-million bond issue on April 7, 2015 by a 68.2 percent margin, the school district is providing community storm shelters to protect area residents during tornado outbreaks, working in cooperation with the area’s emergency services,” Max Tanner, Oologah-Talala superintendent said. The storm shelters will be available and open to the public during weather emergencies after school class dismissal on school days, full-time on weekends and school holidays and vacations, and during after-school athletic or activity events. Shelters will be activated any time the school district is under a TORNADO WARNING or an adjoining county is under a TORNADO WARNING if the National Weather Service or a recognized path-calculated by television radar system projects the storm to hit the Oologah or Talala areas. OTEMS ambulance, the Northwest Rogers County Fire Protection District and Oologah Police Department will ensure the shelter is opened when needed and emergency services are available consistent with the other needs created by such storms. Recognized storm radars are those used by KJRH-TV2, Newson6 (KOTV-TV6), KTUL-TV8, and KOKI-TV23 (Fox 23) and their affiliates which use their radar path-calculation systems. Residents should respond to the shelter immediately upon such a projection, as being caught in a car on the road when a tornado hits is extremely dangerous and the time to seek shelter is before the storm actually reaches the Oologah-Talala area, officials said. Cars need to be parked only in the marked parking areas so emergency vehicles have needed access to the shelters and school complex, located at US 169 and E. 390 Rd. Shelters are equipped with battery backups which can provide enough electricity to ensure proper lighting for multiple hours in cases of power utility disruption. Access to power for charging of electronic devices or other equipment requiring electricity is not provided. Restroom facilities and drinking water are available, and most cell phones should be able to at least send and receive text messages within the shelter despite their heavily reinforced construction. Hand-held two-way radio transmission or reception will range from low-grade to impossible, and Wi-Fi or hard-wired computer hookups are NOT available. First-Aid kits will be available at both facilities. Plans have been under discussion between the school and emergency agencies for weeks, and final details were developed during a meeting Wednesday between the school and OTEMS, Northwest and Oologah police due to long range forecasts that suggest at least a remote possibility of serious severe storms during three windows in the next five or six days. Tanner praised Assistant Superintendent Jerry Rutledge for the day to day supervision of the construction project that brought it in ahead of schedule and under budget, making it available for this year’s tornado season. “This has been a truly cooperative effort to provide a vital service to our residents,” said OTEMS, Northwest and Oologah police officials involved in the effort. “We all remember the April 1991 tornado and what a Godsend having this then would have been. That night marked the commercial birth of real-time televised storm-path prediction technology, which prevented the huge storm from causing any deaths. The shelters will be opened in two phases. Officials will first open the High School shelter adjoining the cafeteria, which holds an absolute maximum of 1,500 people. As it nears capacity, the Lower Elementary shelter will be opened, accommodating another 1,250 people at absolute capacity. Both facilities will have some chairs available and both are handicapped accessible. The shelters will operate under strict rules to maintain order, especially if the number of those seeking shelter nears the capacity of the two shelters. While at the shelter, the following are prohibited: Smoking and/or use of vapor devices, or other tobacco products such as snuff; possession or use of beer or alcohol of any kind; possession of weapons; presence of pets; possession of weapons of any kind; possession or use of illicit drugs, or possession of any other illegal substances. Children must have adult supervision. Each person will be responsible for keeping the shelter clean. Noise should be kept to a minimum. Once inside shelter, occupants must remain there until shelter manager says it is safe to return home. Entering and exiting the shelter will not be allowed. Each occupant is only allowed one small bag. People in the shelter are expected to conduct themselves in a manner that does not interfere or cause problems for the other occupants. Any problems inside the shelter should be reported to the shelter manager immediately.